Prepping the inflatable boat before collecting water and diatom samples on a lake in Greenland. University of Maine’s Jasmine Saros and a team of graduate students and post-doctorate students are in Greenland this summer investigating diatom assemblages for clues on how climate change may impact Arctic lakes. Photo: Jasmine Saros. Diatoms, some of the smallest organisms in the Arctic, may be the biggest indicators of climate-related changes in the region’s lake ecosystems. These tiny, single-celled algae are the focus of a new study led by a researcher at the University of Maine to examine what diatoms in lakes across Greenland can tell us about environmental change. Jasmine Saros is a professor and lake ecologist at the University of Maine’s Climate Change Institute where she studies how climate change affects freshwater ecosystems. This summer she and a small team of graduate students and post-doctorate researchers will travel to Greenland to collect diatoms, study their taxonomy and ecology, as well as document any changes in diatom assemblages. The National Science Foundation supports this research. Discostella stelligera. The glass-like outer cell wall of diatoms gives each species its own unique characteristics. Diatoms grow in the water column of aquatic and marine systems. They also grow attached to surfaces in water. They have a cell wall made of silica that often looks like glass under a microscope. That outer cell wall can come in a wide variety of shapes depending on the species, making them easy to identify. 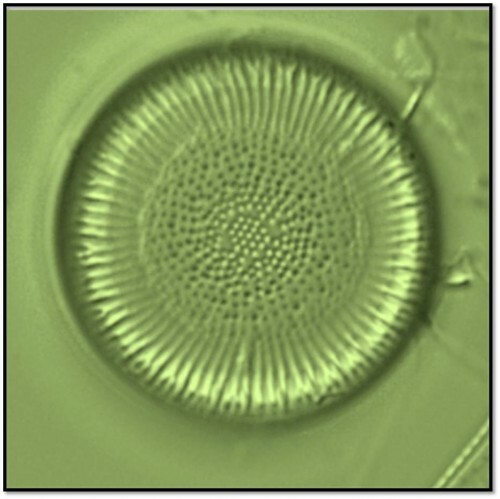 Cyclotella is a key genus of diatoms that Saros and her team will be studying this summer. Previous research has shown that this group has increased in abundance in Arctic lakes during the twentieth century. That increase may be connected to warming temperatures. Yet recent research suggests a more complicated picture, says Saros. The diatom team on their way to one of 30 lakes that are part of the first leg of this summer’s field excursions. Saros and her team have two trips to western Greenland planned in 2013, their first year of data collection. The first trip is set for this month, just after the ice melts off of the lakes and when conditions are still relatively cold. The next trip is a 16-day mission slated for midsummer when conditions are warmer. Cyclotella bodanica. Saros is focusing on C. bodanica is a key genus of diatoms that Saros and her team will be studying this summer. They will gather water samples and diatoms from 30 different lakes around Kangerlussuaq. The lakes in this area can have very different characteristics depending on their proximity to the ice sheet. Sampling such a high number of lakes will give Saros a better idea of how different diatom species are distributed across western Greenland’s lakes. “We analyze the chemistry of the water to look at things like the conductivity (salt concentration) and nutrients present,” she says. Saros is also interested in the physical characteristics of the water column in each of the lakes. Her team will gather measurements on temperature and light, and also examine how these two factors change with depth. Tools of the trade—the researchers prepare to deploy light sensors that measure how light disappears down the water column. Saros and her team of graduate students will do most of their fieldwork from small, inflatable boats. The team will also use a series of special sensors that will be deployed at the center of one of the lakes this summer. The sensors, supplied by partners at Miami University of Ohio, are attached to a buoy to measure temperature, light, chlorophyll and other lake characteristics. Several graduate students are participating in data collection in Greenland … and they are all smiles! Gathering hundreds of water and diatom samples from over 30 lakes in Greenland is no easy task. Thankfully, Saros has the support of several graduate students and post-doctorate researchers from the University of Maine’s Climate Change Institute. They include post-doctorate researcher Robert Northington; Kate Warner and Erin Hayes-Pontius, both graduate students; communications graduate student Emily Rice, who will be working on a virtual field experience teaching module; and microbiology graduate student Ben Burpee.